Key information and investor terms. By investing through RateSetter you are entering into credit agreements as a lender with one or a combination of individuals or businesses as the borrower(s). This is an investment product and is not a savings deposit. To invest through RateSetter, you must not be lending in the course of business. RateSetter manages a Provision Fund which is designed to give you efficient risk diversification and some degree of risk protection but it is not a guarantee and your capital is at risk. The overall level of investment risk is primarily affected by the strength of the Provision Fund and the lending carried out by RateSetter. As well as the Everyday Account, RateSetter offers an innovative finance ISA (the “RateSetter ISA”) which allows any interest from peer-to-peer loans facilitated through the RateSetter platform to qualify for exemption from income tax where these loans are made within a RateSetter ISA. 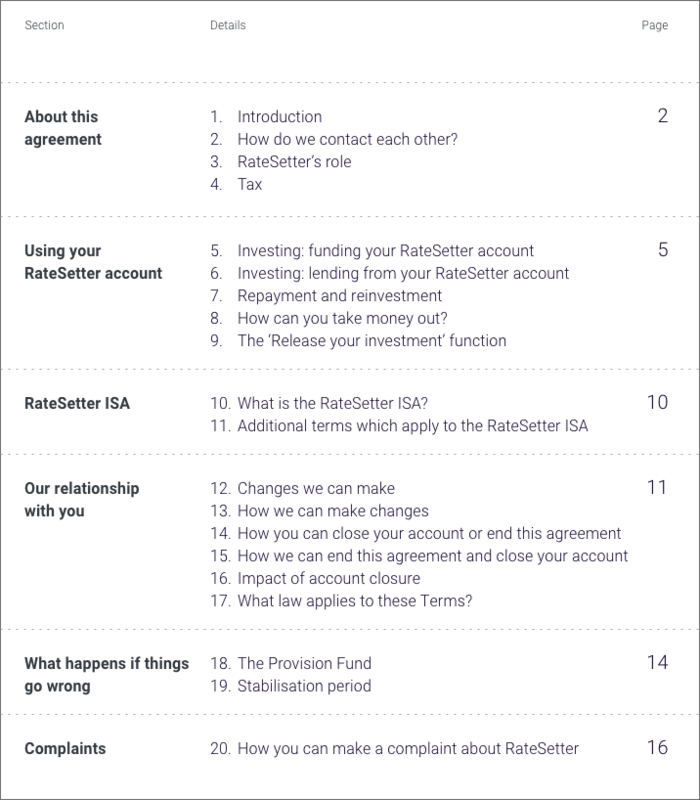 RateSetter facilitates loans to UK individuals and businesses – further detail is provided below. RateSetter provides information on the lending mix here and will inform you when material changes occur, including by posting information on the members’ area of the website. Our minimum requirements for borrowers vary according to the type of loan being offered but all decisions are based on risk assessments by our specialist underwriting teams. See below and further information is available here. assess their ability to make repayments (affordability). where appropriate, take other security, for example by putting a charge over the company’s assets or requiring a cross-company guarantee. You may be matched to loans with differing repayment profiles, including loans that repay capital and/or interest across the life the loan or loans that repay capital and interest only at the end of the loan term. Total interest earned is made up of interest received and interest accrued. Interest received is the interest that has been repaid to you by the borrower(s) from any loan type. Interest accrued is interest that is building up on loan types where the borrower repays the interest and capital in a single payment at the end of the loan term. Once the borrower has repaid, interest accrued becomes interest received. You may also be allocated loans from the RateSetter secondary market, where a previous investor has decided to exit their loan contract or loan contracts early and you are replacing their funds on that contract. You should also carefully review past performance information which provides an indication of past and expected future performance of loans. Please see here for further information. RateSetter manages a Provision Fund which gives efficient diversification to investors and provides a degree of protection for investors against borrowers who do not pay sums due or are in arrears with payments. In cases where a borrower does not make a payment when due, the Provision Fund pays you on their behalf. We believe in treating all our customers fairly, both investors and borrowers, so we always do what we can to help borrowers who experience payment difficulties. If, despite our efforts, we cannot get the loan back on track, the Provision Fund will settle the loan with you in full or in part. You can then re-invest the settled funds in a new loan contract or withdraw the settled funds. RateSetter proactively manages the Provision Fund but it does not provide a guarantee and your capital is at risk. The Coverage Ratio is a key Provision Fund metric and it is important that you understand it. It is how we estimate the Provision Fund’s ability to ensure investors get all their capital back, plus interest earned. It is calculated by dividing the size of the Provision Fund by Expected Losses. A 100% Coverage Ratio indicates that the Provision Fund should be able to cover all expected claims; a Coverage Ratio greater than 100% means that all expected claims should be covered with money to spare. The Provision Fund will cover borrower defaults if there are sufficient funds available. In one exceptional case, RateSetter has intervened to cover the debt repayments of a borrower from its own company funds that would otherwise have been defaulted to the Provision Fund. Such an intervention will not happen again. If the Provision Fund has insufficient funds to cover borrower defaults (i.e. the Coverage Ratio has or is expected to drop below 100%) you may receive less interest than you expected, lose some or all of the capital you invested and / or it may take longer than expected for you to receive your money back. Your investment is for the term of the loans you are matched with. The terms of the underlying loans may be longer or shorter than your requested investment term. You may be matched against loans from the RateSetter secondary market with considerably shorter terms than you have requested. 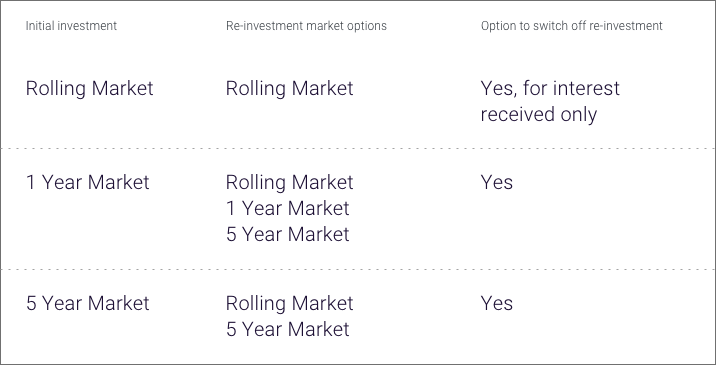 As an investor you can request access to funds earlier than the underlying loan terms but that is dependent on other funds being available on the RateSetter market to take your place and therefore early access is not guaranteed. There may also be costs for exiting loan contracts early, depending on the product selected. In order to ensure fair usage, you cannot invest new funds for 14 days after a request to exit a Rolling Market loan contract early. When borrowers repay capital and interest due you have the option to re-invest funds. These funds will be matched with new loans and so your term for re-invested money will match the new loans, not your original investment term. If you have invested in the Rolling Market, any capital will always be re-invested in the Rolling Market. Interest can still be paid into the Holding Account, but if you opt to re-invest your interest, it must be in the Rolling Market. You can set the rate or opt for Market Rate on reinvestment of capital and interest in all RateSetter markets. What will impact on your return? The rates quoted on the RateSetter website are based on re-investment of borrower repayments at the same interest rate. If market rates have changed since your original investment it will affect your overall return. RateSetter allows borrowers to repay all or part of a loan at any point. If early repayment occurs it will affect your overall return. RateSetter does not pay interest on any funds that are held in your RateSetter holding account, i.e. un-lent funds. You should either re-invest or withdraw funds that are unmatched for a significant period of time. You are responsible for paying any tax due on your investment. We do not deduct any tax. What happens if RateSetter stops trading? RateSetter maintains a fully funded plan that is designed to allow the company to continue to administer existing loan contracts even if the company closes to new business. So, in the unlikely event of RateSetter ceasing to trade, your loan contract(s) will continue to be administered on your behalf. If you have a RateSetter ISA, in the event of RateSetter’s insolvency, we will notify you of any right to transfer it to another ISA manager. Can I cancel my investments? You can cancel your account with RateSetter within 14 days, beginning on the day after the date when your account was opened. You will lose this cancellation right once you have been matched to borrowers, simply as loan contracts are formed at that point. We publish loan performance data online, as well as information about our Provision Fund and expected future performance. Via the members’ site and monthly statements that all investors receive, we will also provide updates on factors that may impact your investment return or risk. Please note that historic information should not be used as the sole indicator of future performance. We may need to update our terms and conditions from time to time. When we do, we will notify you personally in advance, usually providing 30 days’ notice. You can close your account or end this agreement at any time by informing us by email, telephone or post using the contact details set out in the Investor Terms. To close your account, you must first release your investments from all of your loans and withdraw any funds in your holding account. You may encounter Early Access fees to release your investments. 1.1. Retail Money Market Ltd (“RateSetter”, “us”, “we”) is a limited liability company registered in England and Wales (company number 07075792). Our registered office address is 6th Floor, 55 Bishopsgate, London EC2N 3AS. We are authorised and regulated by the Financial Conduct Authority (reference number 722768). 1.2. We provide an exchange platform on ratesetter.com and other websites operated by or on behalf of selected partners. The purpose of the platform is to facilitate the arrangement of credit agreements between borrowers and lenders, either or both of which may be individuals or companies. You confirm that when lending through the platform, you are not lending in the course of business. 1.5. Unless otherwise stated, these Terms apply to all RateSetter investment products. Some additional terms apply only to the RateSetter ISA, which you can find in the RateSetter ISA section of these Terms. 1.6. Any money you invest through RateSetter is not covered by the Financial Services Compensation Scheme (FSCS). 1.7. We determine when our platform or any part of it is open and may close it at any time. We are not obliged to accept any offer made on the platform. The fact that the platform is generally always open does not mean that you’ll always be able to lend on it, as this relies on borrower demand for loans. 2. How do we contact each other? 2.1. We’ll provide performance information about your RateSetter account through the Members’ Area on our website. We also publish notices on our blog on the website at https://www.ratesetter.com/blog. 2.2. If we need to contact you personally, for example, to give you a notice or to tell you about a security breach, we’ll use post, telephone, or any other electronic format (including email and text message) and will use the most recent details you have provided to us. We’ll always communicate with you in English. 2.3. We often include notices within our monthly investor statement email, so please look out for those and read them carefully. *Please note that we may record or monitor telephone calls for training and quality purposes. 3.1. Our role is to operate the RateSetter platform which matches lenders with borrowers, and to facilitate credit agreements between them. We also administer and manage all aspects of these loans on your behalf. anything else RateSetter reasonably considers necessary to manage your loans, including terminating those loans. 3.3. RateSetter, or any agent acting for or on behalf of RateSetter, may appoint a third-party service provider to perform RateSetter’s duties under these Terms. In these circumstances, any rights or obligations in these Terms which relate to RateSetter shall become the rights and obligations of the appointed third party. 3.4. You agree to be bound by the terms of any loans entered into on your behalf and any amendments to those terms as agreed by RateSetter. By lending through the RateSetter platform, you may lose money if one or more borrowers fail to repay their loans. 3.5. You’re not allowed to transfer to anyone else any of your rights or obligations under these Terms or under any credit agreements for which you act as lender other than in accordance with these Terms or with RateSetter's prior written consent. 4.1. At the conclusion of each tax year, your tax statement will be available to download via the RateSetter Members’ Area on our website. The statement will contain a summary of the taxable income you have earned during the most recent tax year. 4.2. RateSetter does not withhold any tax so any taxable income you earn should be included in your annual tax return. The information included in your tax statement has been prepared by RateSetter and is intended as general guidance and information. As always, you should seek independent financial/tax advice in relation to any questions you have around your specific circumstances or taxation in general. 4.3. RateSetter is legally required to submit an annual report to HMRC detailing the interest received by each retail investor within the preceding tax year. The holding account is a segregated client money bank account held by one of the major UK high street banks on trust for RateSetter customers. This ensures that should RateSetter cease to trade, the money held in this account will not be considered to be part of RateSetter’s assets and will be available for return to you. 5.1. To start investing through the RateSetter platform you need to transfer funds into your RateSetter holding account via the Members’ Area of our website. 5.2. The holding account is a segregated client money bank account held by one of the major UK high street banks on trust for RateSetter customers. This ensures that should RateSetter cease to trade, the money held in this account will not be considered to be part of RateSetter’s assets and will be available for return to you. 5.3. You must also provide us with the details of the UK bank account that you wish to use to send and receive funds when using the platform (your “Nominated Bank Account”). The Nominated Bank Account must be in your name and registered to your current address. 5.4. When you pay money into the holding account, you’re confirming that you’re authorised to do so. If your Nominated Bank Account is a joint account, you confirm that when making transfers into the holding account, you’re acting with the authority of the joint account holder. setting up a monthly direct debit using the Auto Invest feature in your RateSetter account. 5.6. Funds sent by bank transfer or Direct Debit may take up to two working days to show in your holding account and be available to lend on the platform. Payments made by debit card should be processed the same day, subject to completion by your payment provider. 5.8. In exceptional circumstances, this may lead to us delaying, blocking or refusing the making or clearing of any payment and/or the processing of your instructions or access to the RateSetter platform. 5.9. We may at any time, after giving you reasonable notice of our intention to do so, set off any sums owed by you to RateSetter or to another RateSetter investor against any funds held in a RateSetter account in your name. 6.1. Once you have money in your holding account, you need to make an offer to lend. To do this, you’ll need to follow the process on our website. We’ll then match you to an eligible borrower(s). 6.2. If you choose to lend at the “Market Rate” (which is set each day by taking a weighted average of all the rates transacted during the previous 28 days), you accept that the calculation of the Market Rate at the time any funds are matched is correct as at the time of matching. RateSetter makes no guarantee as to the level of the Market Rate at any given time or any given day. 6.3. Lenders are matched within each market first by rate and then by time, subject to the rule that existing funds being reinvested are prioritised ahead of new funds. This means that if multiple lenders are offering the same rate and all are reinvesting, they will be matched in order of when they placed their offer to lend on the platform. 6.4. An offer to lend may be posted on its own or may be combined with other offers to lend and may be accepted on behalf of one or a combination of multiple RateSetter borrowers. 6.5. You can withdraw all or part of an offer to lend (until it has been matched) by cancelling the relevant offer in your RateSetter account. The cancellation of an outstanding offer to lend becomes effective when your instruction to cancel is successfully received and processed by us, which is usually done within one working day. Until we process the cancellation, your offer may remain outstanding and available for acceptance. 6.6. Once all or part of your offer to lend has been matched to a borrower, you’ll be bound by the terms and conditions of the resulting loan(s) and you won’t be able to amend, cancel or withdraw from the loan(s) other than in accordance with these Terms. 6.7. When a borrower order is fully matched to lender funds, the loan will be formed the same day and the funds sent to the borrower on the next working day. Interest will accrue daily on the capital amount outstanding from the day after the formation date up to and including the date on which the loan is settled in full. This means that if your funds are matched to a new loan, you will begin to accrue interest the working day after the loan is formed. If your funds are matched to an existing loan (e.g. if another lender is using the Release Your Investment function), you’ll begin to accrue interest on the calendar day after your funds are matched. 6.8. When you lend on the RateSetter platform, you may be matched with borrowers in respect of a variety of credit agreements, including hire purchase agreements (although in these Terms we just refer to loans for simplicity). If you become a lender under a hire purchase agreement, RateSetter or one of its affiliates will hold the asset subject to the hire purchase agreement on trust for you and any other lenders funding the purchase of that asset. Any surplus received on a sale of an asset, less obligations to third parties, will be added to the Provision Fund. 7.1. The scheduled capital and interest repayments payable to you for each loan you have funded will be set out in the respective borrower loan agreements which we enter into on your behalf. Interest accrues daily and you can view a summary of amounts due to you under all of your loans in the RateSetter Members’ Area on our website. 7.3. You can change the way your funds are reinvested by altering the reinvestment settings in your RateSetter account. Any changes to your reinvestment settings normally take effect immediately but may take up to 24 hours to be activated. 7.4. If you invest in the Rolling Market, your capital will always be reinvested in the Rolling Market. Interest received can still be paid into the holding account, but if you choose to reinvest your interest, it must be in the Rolling Market. 8. How can you take money out? 8.1. You can transfer funds from your holding account into your Nominated Bank Account by choosing one of the withdrawal options in your RateSetter account. Withdrawals are normally credited to your Nominated Bank Account by the end of the next working day but may be delayed up to 5 working days in cases where additional fraud or identity checks are required, for example when you make your first withdrawal. You can’t withdraw funds into any account other than your Nominated Bank Account. 8.2. You can’t withdraw funds which are waiting to be matched or which have already been matched. Where funds are waiting to be matched, you may be able to cancel all or part of your order, as set out in “How you can close your account or end this agreement”, which you can find in the section on “Our relationship with you”. 8.3. If your funds have already been matched, you can only withdraw them using the Release Your Investment function detailed below. 9.1. Once your funds are matched and a loan is formed, you may be able to withdraw matched funds before they are repaid by the borrower by using the "Release Your Investment" function, but this will only be possible where there are sufficient funds available in the market. 9.2. Your loans will be sold on a “last in, first out” basis, i.e. starting with the most recent contract, regardless of rate. You cannot transfer loan contracts with a value of less than £10, and you cannot transfer any loan contracts on the same day that they have been matched or reinvested. 9.3. If you’re using the Release Your Investment function, the amount returned to you will equal the capital amount requested plus interest accrued on that amount to the date your funds are released, minus an Early Access Fee. 9.4. The Early Access Fee will be calculated as a percentage of the capital being returned from your loans and will be a set rate for each of the markets. The Early Access Fee for each market will be displayed on the website and may change over time (but we’ll let you know at least one month in advance if the fees change, as explained in the section called “How we can make changes”). The amount to be returned to you will be estimated and displayed to you before you commit to releasing your funds. 9.6. If you use the Release Your Investment function to withdraw funds from the Rolling Market, you must wait until 14 days after the date of your request to sell out before you can invest new money in the Rolling Market. Any money you try to invest will sit in your holding account until the 14-day period has expired and you can invest the funds. 10. What is the RateSetter ISA? 10.1. The RateSetter ISA is an innovative finance ISA. We will act as your ISA manager and report to HMRC in relation to your RateSetter ISA account. 10.2. If you decide to invest through the RateSetter ISA, the following terms will apply in addition to the rest of these Terms. 11. What additional terms apply to the RateSetter ISA? 11.1 The resulting loans you make through your RateSetter ISA must remain in your beneficial ownership and you must not use them as security against any loan. 11.2. We are required to provide details of all RateSetter ISA holders to HMRC. If you become a non-UK resident, HMRC may then be required to share these details about your RateSetter ISA with tax authorities in your country of residence. You must let us know immediately if you become a non-UK resident. 11.3. The RateSetter ISA is a flexible ISA, which means that any money you withdraw from it can be replaced by subsequent subscriptions in the same tax year, without affecting your remaining annual ISA subscription limit. 11.4. Where you have money not on loan that is in the holding account set up for your RateSetter ISA, this will be treated as cash and can be withdrawn into your nominated bank account using the process set out under “How can you take money out?”. 11.5. If you withdraw money from your RateSetter ISA in this way, you may lose the ability to earn tax-free interest on the cash withdrawn. 11.6. You have the right to transfer your RateSetter ISA to another ISA manager. You can transfer some or all or your previous years’ RateSetter ISA subscriptions, but you can only transfer out the whole of the current year’s subscriptions. 11.7. If we receive notice that you want to transfer your RateSetter ISA to another ISA manager, we will carry out the transfer in accordance with your instructions and the Individual Savings Account Regulations 1998 or the accompanying HMRC ISA guidance (together and as amended from time to time, the “ISA Rules”). 11.8. If any changes are made to the ISA Rules which affect the RateSetter ISA, we will apply the changes immediately after they come into force, and we will notify you of them and how they affect you as soon as possible thereafter. 11.9. We will let you know if, by reason of any failure to satisfy the provisions of the ISA Rules, your RateSetter ISA has or will become void. 11.10. The ISA Rules now allow investors to continue to benefit from the tax advantages of an ISA after their death, during the administration period of the estate. This means that if you die on or after 6 April 2018, any income or gains you receive into your RateSetter ISA account after the date of your death until the date of closure of the ISA will be exempt from tax. 12.1. As our agreement has no fixed end date, it’s likely we’ll need to update these Terms to cover changes we make to our business and other changes outside our control, as set out below. We’ll only make changes for these reasons if it’s reasonable for us to pass on the impact of that change to you. 12.2. We may also need to make changes for reasons that aren’t covered here, as we can’t predict all of the reasons we may need to make changes to these Terms in future. (e) changes to how we operate the platform such as changes in technology or the systems we use or the products and services we offer. 12.4. We may make other changes without giving you a reason, but if we do so, we’ll explain the impact on you and you’ll be free to close your RateSetter account at no extra cost before the changes are implemented (but if you have money on loan, you’ll still need to pay the Early Access Fee in order to release your investment). 13.1. If we make a change to your benefit relating to RateSetter products or services (including increasing interest rates you receive or reducing charges), we’ll tell you within 30 days after the change takes place. This could be by contacting you personally (including in the monthly investor statement), or by publishing it on our blog. 13.2. For all other changes, we’ll tell you personally at least 30 days before we make the change. 13.3. At the end of the notice period, the changes will apply automatically and we’ll provide a copy of the updated Terms for you to download and keep for your records. 13.4. If you don’t want to accept the change, you can close your account in accordance with “How you can close your account or end this agreement” below) at any time before the change takes effect. 13.5. If you continue to use your RateSetter account after the change takes effect, you’ll be deemed to have accepted it. 14.1. You can close your account or end this agreement at any time by telling us by email, by telephone or by post, using the contact details set out at the front of these Terms. 14.2. If you want to close your account, you must first have released your investments from all of your loans (as set out in the section called The “Release Your Investment” function) and withdrawn any funds in your holding account. 14.3. You also have the right to cancel your RateSetter account within the cooling-off period (which is the first 14 days, beginning on the day after the date when your account was opened). You will lose this cancellation right once you have been matched to borrowers, because loan contracts are formed at that point. 15.1. We can end our agreement with you, close or suspend your RateSetter account and stop providing any services by giving you at least two months’ notice. (e) you are likely to become bankrupt or subject to an Individual Voluntary Arrangement or a Debt Relief Order or a Sequestration, Trust Deed or Debt Arrangement in Scotland. 16.1. If you or we close your account, we’ll send the amount in it to your Nominated Bank Account (having first taken anything you owe us). You are responsible for cancelling any Direct Debit investment instructions from your Nominated Bank Account. 17. What law applies to these Terms? 17.1. These Terms (including any non-contractual obligations arising out of or in connection with them) are governed by the laws of England and Wales and the courts of England and Wales will have exclusive jurisdiction in relation to any and all disputes arising from them. 17.2. If a provision of these Terms is or becomes illegal, invalid or unenforceable that shall not affect the legality, validity or enforceability of any other provision of these Terms. 18.1. To provide protection to RateSetter investors, RateSetter and/or its partners set aside funds as a provision against borrower defaults for the benefit of all consumer RateSetter investors (the "Provision Fund"). 18.2. The Provision Fund is not a guarantee, it does not mean you will always get your money back and your capital and interest are at risk if the Provision Fund is depleted. The Provision Fund does not amount to a contract of insurance under the Financial Services and Markets Act 2000. 18.3. If a payment becomes due under the terms of any of your loans and is not paid by the borrower, the Provision Fund will automatically make payment to you on the borrower’s behalf, provided that a Stabilisation Period has not been implemented. If this happens, you agree that any right you had against the borrower in respect of that payment will be transferred to the Provision Fund. The Provision Fund may then seek to recover the payment from the borrower for its own account. 18.4. You can find more details about the Provision Fund, including the coverage ratio, on our website. We also include this in our monthly investor statements. 19.1. If at any time, the Provision Fund does not have sufficient funds to cover current or expected borrower defaults and RateSetter reasonably believes this is not capable of being rectified through the ordinary course of business, RateSetter may implement a “Stabilisation Period”. 19.2. If RateSetter implements a Stabilisation Period, RateSetter will continue to treat all RateSetter investors fairly and act in their best interests, seeking to minimise the loss to them at all times. 19.3. During a Stabilisation Period, RateSetter may reduce the interest rate and/or capital repayments investors are entitled to (an “Interest Reduction” or a “Capital Reduction” respectively). The amount of any reduction will apply equally to all RateSetter investors entitled to protection from the Provision Fund as at the date the Stabilisation Period is entered into, and will be paid in full into the Provision Fund. 19.4. The amount of any Interest Reduction or Capital Reduction will be reflected in your RateSetter account when the deduction is made but will only be paid into the Provision Fund when the relevant payment is made by the borrower. 19.5. An Interest Reduction will be applied if the Provision Fund Coverage Ratio is or will imminently be below 100%. An Interest Reduction will result in a reduction to the interest rate you are entitled to receive during the relevant period. For example, if you have invested £1,000 at a rate of 5%, during normal operation approximately 14p of interest would accrue daily ((£1,000 x 0.05) / 365). If there is an Interest Reduction of 50% for 10 days, the Lender Rate for those 10 days would reduce to 2.5% and interest would accrue at 7p per day. When the borrower pays that interest (which could be during or after the Stabilisation Period), 70p will automatically be deducted from the payment due to you (10 x 7p) and paid into the Provision Fund. 19.6. A Capital Reduction will be applied if the Capital Coverage Ratio is or will imminently be below 100%. If there is a Capital Reduction, you agree to assign your right to the amount of the Capital Reduction to the Provision Fund. For example, if you have £1,000 matched on the platform and there is a Capital Reduction of 1%, you agree to assign the right to £10 of capital to the Provision Fund. You will then no longer have any right to that amount of capital or any interest accruing on that capital. When the borrower next makes a payment of capital (whether or not that is during the Stabilisation Period), £10 of the payment will be automatically deducted and paid into the Provision Fund. 19.7. We’ll tell you if the platform enters into or ceases to be in a Stabilisation Period and/or if an Interest Reduction or Capital Reduction is applied, increased or reduced. At RateSetter we put our customers’ best interests first. We recognise that award-winning customer service is not just about the good times, it’s about how we help you when things don’t go as planned. That’s why if we make a mistake, we promise we’ll go out of our way to make it right. write to us at RateSetter, 1 The Osiers Business Park, Laversall Way, Leicester LE19 1DX. 20.2. Please refer to our Complaints Procedure at: https://www.ratesetter.com/complaints-procedure for more information. 20.3. Upon receipt of a complaint we endeavour to acknowledge the complaint within 3 working days. 20.4. We aim to resolve the complaint within 8 weeks of receipt of the complaint. the best way to contact you if we need more information. 20.7. There is also an online dispute resolution platform created by the EU Commission which allows you to submit your complaint through a central site which will forward the complaint to the right dispute resolution scheme. In the UK, this is the Financial Ombudsman Service. You can contact them directly using the above contact details. Alternatively, you can visit the online dispute resolution platform site at http://ec.europa.eu/consumers/odr.